A star-studded and visually stunning box office hit, and a tale of first love directed by two-time Academy Award-nominated filmmaker Wes Anderson (The Royal Tenenbaums, Fantastic Mr. Fox, Rushmore), Focus Features’ Moonrise Kingdom will be available on Blu-ray Combo Pack with UltraViolet, on DVD, On Demand and on Digital Download today, October 16, 2012, from Universal Studios Home Entertainment. Set on an island off the coast of New England in the summer of 1965, MoonriseKingdom follows two 12-year-olds who fall in love, make a secret pact and run away together into the wilderness. As various authorities try to hunt them down, a violent storm is brewing off-shore – and the peaceful island community is turned upside down in every which way. 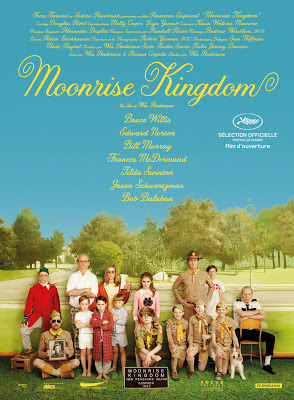 Moonrise Kingdom had a wonderful cast line up such as Bill Murray, Edward Norton, Frances McDormand and Bruce Willis. I was excited to watch this movie for the cast alone, although the characters were interesting, there wasn’t any one performance that really screamed amazing (at least for me). The movie started out with a comedic and quirky story of a couple preteen kids (Jared Gillman and Kara Hayward) that were products of a damaged family life at home. The duo run away to comfort each other and explore some coming of age experiences, including romance, while a group of adults who are a little ‘off’ create a search party to find them. The story takes an emotional turn when the kids are found (which feels more like captured) and are faced with Social Services. This movie is definitely not for everyone! It has a little whimsy to it and is pretty awkward in it’s comedy. Moonrise Kingdom is a wonderfully artsy movie that is set in 1965 on a remote New England island. I would watch this movie again for the images/setting alone….Not to mention for Edward Norton ( one of my personal favorite actors) who plays a very dedicated Camp Scout leader. J! Disclosure: All opinions are my own. I received Moonrise Kingdom at no cost for the purpose of this review. No other compensation was received.